The use of ceramics in biological environments and biomedical applications is of increasing importance, as is the understanding of how biology works with minerals to develop strong materials. Specific information about biomimetics, and processing, performance and interactions of materials for biomedical applications is presented in this collection. 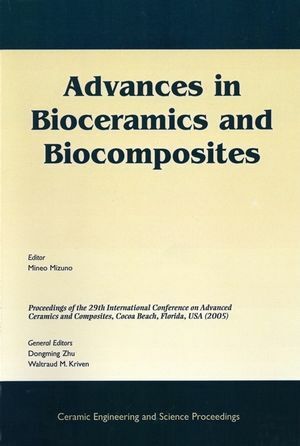 Mineo Mizuno and Dongming Zhu are the editors of Advances in Bioceramics and Biocomposites: A Collection of Papers Presented at the 29th International Conference on Advanced Ceramics and Composites, Jan 23-28, 2005, Cocoa Beach, FL, Volume 26, Issue 6, published by Wiley. Preparation and Bioactive Characteristics of Porous Borate Glass Substrates (M.N. Rahaman, W. Liang, D.E. Day, N.W. Marion, G.C. Reilly, J.J. Mao). Processing of Thermally Sprayed Tricalcium Phosphate (TCP) Coatings on Bioresorbable Polymer Implants (M. Baccalaro, R. Gadow, A. Killinger, K. v. Niessen). Synthesis and Sintering Studies of Nanocrystalline Hydroxyapatite Powders Doped with Magnesium and Zinc (H. Bhatt, S.J. Kalita). Sequence Specific Morphological Control Over the Formation of Germanium Oxide During Peptide Mediated Synthesis (M.B. Dickerson, Y. Cai, K.H. Sandhage, R.R. Naik, M.O. Stone). Synthesis of Nano-Size Hydroxyapatite (HAp) Powders by Mechanical Alloying (S.J. Hong, H. Bhatt, C. Suryanarayana, S.J. Kalita). Dry High Speed Milling as a New Machining Technology of Ceramics for Biomedical and Other Applications (A. Georgiadis, E. Sergeev). Nanoceramics Intercalated with Gd-DTPA for Potential Imaging of Systems In Vivo (S.-Y. Kwak, W.M. Kriven, R.B. Clarkson, B.J. Tucker, R.L. Belford). Nanophase Hydroxyapatite Coatings on Titanium for Improved Osteoblast Functions (M. Sato, M.A. Sambito, A. Aslani, N.M. Kalkhoran, E.B. Slamovich, T.J. Webster). A Comparative Evaluation of Orthopaedic Cements in Human Whole Blood (N. Axén, N.-O. Ahnfelt, T. Persson, L. Hermansson, J. Sanchez, R. Larsson). Self-Setting Orthopedic Cement Compositions Based on CaHPOX4 Additions to Calcium Sulphate by J.N. Swaintek, C.J. Han, A.C. Tas, S.B. Bhaduri Adhesive Strength of the Apatite Layer Formed on TiO2 Nanoparticles/High Density Polyethylene Composites (M. Hashimoto, H. Takadama, M. Mizuno, T. Kokubo). Effect of Reinforcements on Properties of Self-Setting Calcium Phosphate Cement (N.C. Bhorkar, W.M. Kriven). The Bioactivity of PDMS-CaO-SiO2 Based Hybrid Materials Prepared by the Addition of Transition Metal Alkoxides (M. Fukushima, E. Yasuda, H. Kita, M. Shimizu, Y. Hoshikawa, Y. Tanabe). In Vitro Comparison of the Apatite Inducing Ability of Three Different SBF Solutions on Tiz6A14V (S. Jalota, A.C. Tas, S.B. Bhaduri). In Situ and Long Term Evaluation of Calcium Phosphate Cement Behavior in Animal Experiment (M. Mukaida, M. Neo, T. Nakamura, Y. Mizuta, Y. Ikeda, M. Mizuno). Resorption Rate Tunable Bioceramic: Si&Zn-Modified Tricacium Phosphate (X. Wei, M. Akinc). Microleakage of a Dental Restorative Material Based on Biominerals (H. Engqvist, E. Abrahamsson, J. Lööf, L. Hermansson). A Comparative Study of the Microstructure-Property Relationship in Human Adult and Baby Teeth (I.M. Low, N. Duraman, J. Fulton, N. Tezuka, I.J. Davies).